NI Communities Minister Paul Givan, MLA has today handed out the first awards from the ‘Defibrillators for Sport’ initiative to five local sporting clubs in the Lisburn area. The Minister took the opportunity to make the announcement at a celebration event to mark the 100th anniversary of the birth of Professor Frank Pantridge, the man responsible for inventing the life-saving defibrillator machine. The event was hosted by Lisburn and Castlereagh Council at the Civic Headquarters in Lisburn. 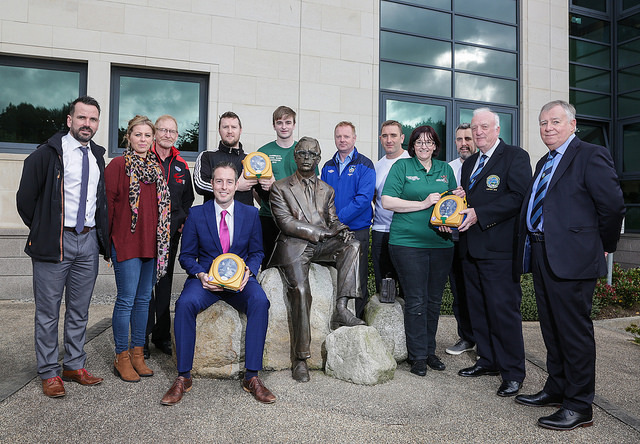 The announcement marks the start of the roll-out of 380 Automated External Defibrillators (AEDs) being awarded to sports clubs and organisations across Northern Ireland. Minister Givan said: “My Department, through Sport NI, has launched this new initiative to provide defibrillators for sporting clubs and organisations right across Northern Ireland. “By launching this initiative there are a number of key messages that I want to deliver about this life saving equipment including the need for training and awareness on CPR and the benefits of having an AED should the need arise. The initiative will be rolled out through Sport NI who will be undertaking the initial training and awareness session with all those who have been successful in being awarded an AED. Speaking about the celebration event, the Minister continued: “The legacy of Frank Pantridge’s work is not only the immense benefit of defibrillation within the professional health sector but also the growing desire across the Northern Ireland community for public access to the vital life saving Automated External Defibrillator (AED).